We came here because my parents suggested it for being cheap and tasty. 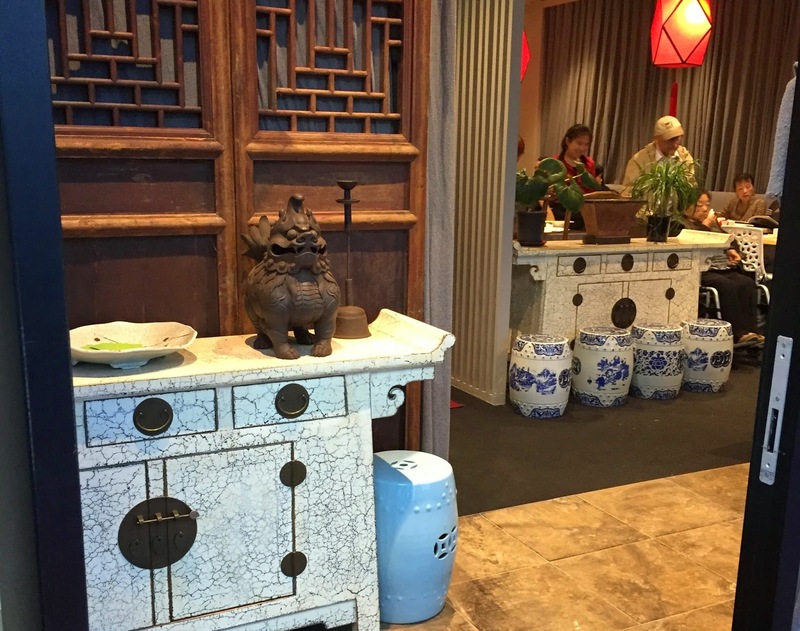 After doing some web searches, I discovered the Sichuan restaurant is part of a chain which started in Beijing in 2008. The original store had a couple of trees growing through the roof of the main dining room, hence the name of the restaurant. Entrance to Spring Trees restaurant. The menu was huge, both in terms of the size of the pages and the number of items available. It was full of colour pictures, some taking up a whole page. Large full colour menu with lots of pages. The setting was new and modern. There was a dining room on the right, a series of booths on the left of the corridor, and private rooms down the back, which you can have a nosy at on the way to the bathroom. Along the way, you'll also see some food storage areas that are less tidy too. The restaurant was pretty much full, so I would recommend you make a booking. Nanjing-style salted duck 金陵盐水鸭 ($12) - as the name suggests, this was salty. It was also chilled, with relatively dry flesh, like tasty preserved meat. Mapo tofu 麻婆豆腐 ($8) - this Sichuan dish with bean curd and pork mince was really well done, and the portion size was huge for the price. Nanjing-style salted duck and mapo tofu. Mixed beef and honeycomb with chilli sauce 夫妻肺片 ($10) - there didn't seem to be any honeycomb tripe here; not sure if they didn't have any or if my parents asked for just beef without me hearing. This cold dish had nice flavours, as with everything else we ate. Griddle cooked lotus root 干锅莲片 ($12) - there was a generous serving of lotus root pieces with little pork slices, set atop a platter with a tea light underneath. Just a little bit spicy, we enjoyed the crisp and slightly sticky nature of this dish. Fried pork with cabbage 手撕包菜小炒肉 ($10) - this was less cabbage than it looks in the photo, because there was a lot of meat underneath. In hindsight, we should have ordered another dish with greens. Despite being cooked with chilli oil like many other Sichuan dishes, this was not very hot and did taste different from everything else. Delicious dasheen roll 香芋吐丝卷 ($5) - literally "taro toast roll", these cigars were dipped into crispy sesame at each end, and filled with a sweet taro paste. The toast part itself was not particularly crunchy, probably due to their reheating method, but can't really complain for that amount of money. White rice ($1 per bowl) - if all the dishes above seemed ridiculously cheap, the rice made up for it by being rather steep. Each bowl was tiny, maybe only three soup spoons worth. I guess they have to make their money somehow. 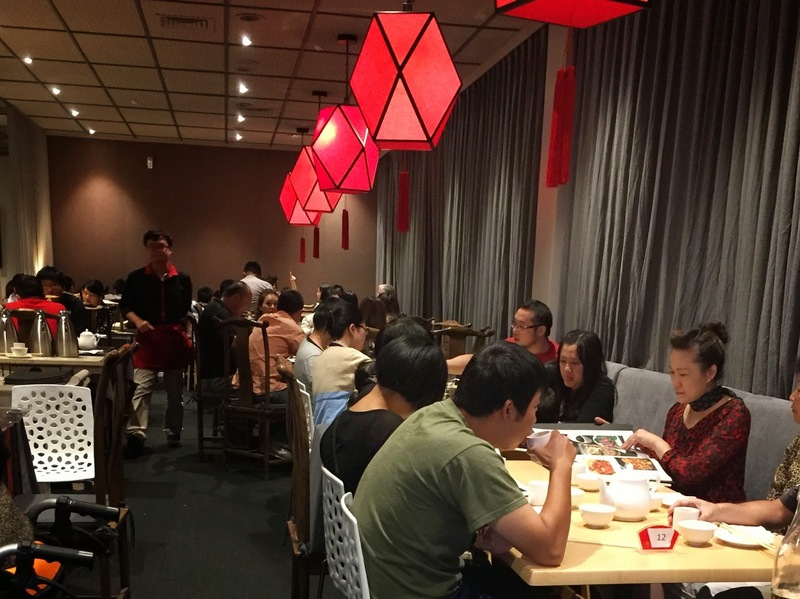 Overall, Spring Trees is a great choice for flavourful Sichuan food, with low prices and decent surroundings. It will be a relatively oily meal which you will want to supplement with plenty of white rice, but the dishes are skilfully cooked and well worth trying. Call ahead as this place is popular. According to their business card, they also have a satellite branch at Unit 13, 16 Gooch Place, Meadowland, Auckland, (09) 533 5008. Cool! I often dine in Newmarket with my family, I'll have to keep this one in mind. The prices seem very cheap for the style of restaurant, more like food court prices? Yeah, it was crazy cheap, especially since it's in Newmarket and had pretty good decor. The food was better and in larger portions than food court food too! Interesting thought about the duck's analogy to ham. Never considered that before, but I guess they are similar in that they are both salted. Different texture of meat though.